After some deliberation, the stewards keep the result the same - Roaring Lion is confirmed as the winner. 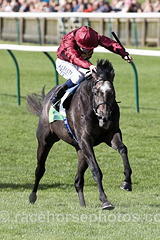 Trainer John Gosden said just before Saturday's Coral-Eclipse Stakes, a European 3-year-old staple at Sandown, that Roaring Lion had grown up. Then the colt proved it. With a determined run down the center of the track, the Kentucky-bred son of Kitten's Joy overtook Saxon Warrior late to run a thrilling rendition of the 1 1/4-mile race. Hawkbill, who won earlier this year on the Dubai World Cup undercard, set the pace and was edged for third by Cliffs of Moher, who was last out of the gate but rallied. The Coral-Eclipse opened up a bit Friday with news that Masar, the recent Epsom Derby winner, had suffered a mild injury in training and would be unable to run. He could have gone off in the favorite. Rather, a field of seven went postward. It was another narrow defeat for Saxon Warrior, who was brought back a week after finishing third as a heavy favorite in the Group 1 Irish Derby. Roaring Lion went off the 7-5 favorite on the U.S. tote with Saxon Warrior at 8-5. Stewards did examine the result, with the inquiry over Roaring Lion's inward move on Saxon Warrior near the finish.